Allison Briner-Dardenne, Carmen Cusack, Stephen Lee Anderson. All photos by Craig Schwartz. Maddie Shea Baldwin, Patrick Cummings, Kaitlyn Davidson, Jeff Blumenkrantz, A. J. Shively, Carmen Cusack. 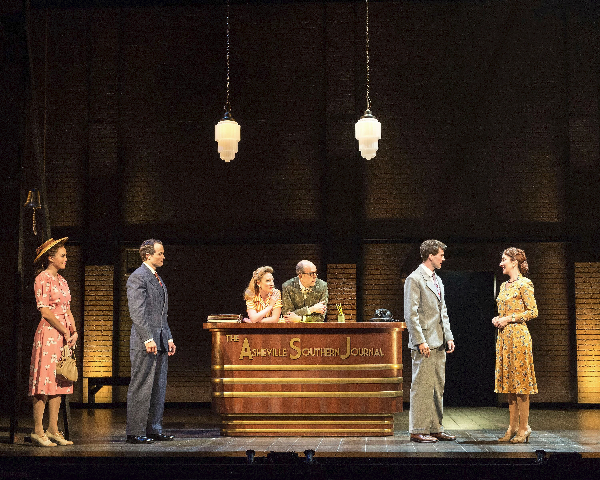 A bright star shines at the Curran Theatre. A paean to simpler times and the music that binds communities together, the stage musical Bright Star offers powerful, uplifting entertainment. Its Broadway run was briefer than hoped. Some say that the material was not a good fit. Others say that Hamilton sucked the air from the market for musicals. One connection with San Francisco is that it seems a bit like the Hardly Strictly Bluegrass Festival for the theatre set. It has the same warm audience vibe and the same broadly distributed representation of ages from young adults to the elderly. All it’s missing is that funny smoke. While Steve Martin’s comedy work pays the mortgage on the mansion, he plays banjo professionally as well. Collaborating with rock/pop/folk artist Edie Brickell on the acclaimed bluegrass album Love Has Come for You led to the deeper involvement of developing the stage show Bright Star. 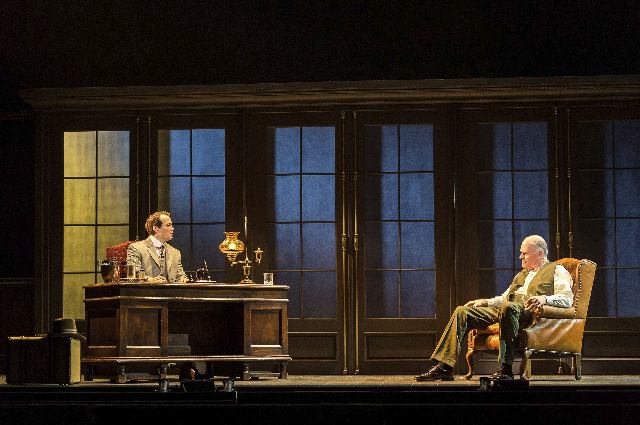 Inspired by a true 1904 event, the artists created a fiction around the occurrence. The setting is North Carolina, and the chronology alternates between the 1920s and 1940s. In the earlier time frame, Alice Murphy is a teen of modest circumstances, and in a not altogether unique storyline, she becomes pregnant by a boy with high standing in her small town community. Predictably, the boy’s father intervenes to separate the boy from girl and baby to avoid a scandal and to preserve the boy’s future as a leader of the community. The scenes relating to these proceedings are a depressing reminder of the hypocritical mores of the day. They reflect poorly on both fathers and the boy, each in a different way. What’s more, the double standard results in holding the girl solely responsible for the pregnancy and punishing her while absolving the boy. Fortunately, Alice has talent and determination. By the 1940s, she has become editor of the Asheville Southern Journal. Throughout the tribulations along the way, a sense of abiding hope prevails in the story, lifted by characterizations of folks who we want to be happy and romances that we want consummated. The music also provides a positive propulsion while embellishing the story. Even though many are ballads that reflect the challenges of life, the problems they bemoan seem destined to resolution. Because of the songwriters’ previous work together, some may refer to the score as bluegrass. While using key instruments from the bluegrass idiom, the music is modern Americana, expressing a broader musical palate. The tunes are highly melodic and the lyrics poignant. 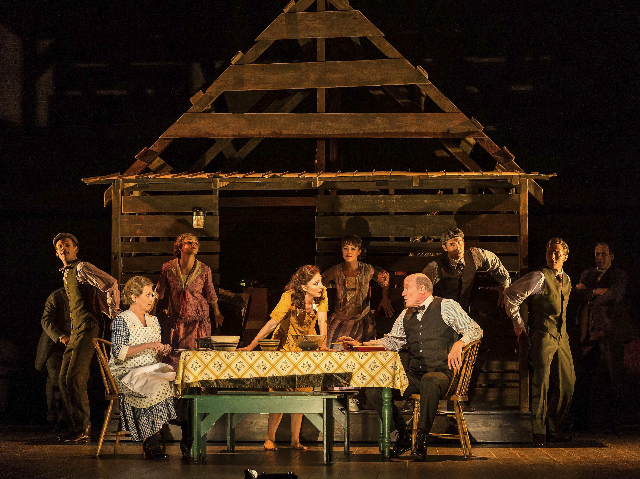 For the greater part, Bright Star is a classic American musical, dressed in country twang. Another highlight of the genial feeling is the staging and the brilliant management of the scene changes. The central feature of the set is the frame of a weathered shack, which provides a front porch for characters and serves to house the band. With each new scene, the shack is twirled to another location. Movable props to depict a library or office or house are rolled around with precise choreography of movers and portables in a very eye pleasing manner. A charming extra is that high above the scenery, a train trestle runs the width of the stage, and a miniature train emitting steam and sound runs across the tracks with changes of venue in the play. Superb lighting and sound complete the overall effect. The cast is outstanding. Many performers in the touring show reprise their roles from the Broadway run. 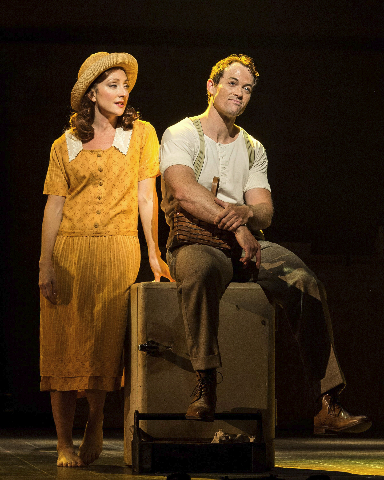 The brightest star is Carmen Cusack as Alice, for which she received a Tony nomination for the Broadway production. She gives an absolutely magnetic performance. Her wavy, rust-red hair, confidence, and plucky independence invoke a backwoods Greer Garson in some of her finest movie roles (If you don’t know who she is, look her up. It’s a high compliment!). Bright Star by Steve Martin and Edie Brickell plays at the Curran Theatre, 445 Geary Street, San Francisco, CA through December 17, 2017 and continues on tour.